Editor’s Note: W Mitchell will be the featured keynote speaker at High Country Conservation Advocates’ Dinner at the Depot: 40th Anniversary Celebration on Sunday, July 30, from 5 to 9 p.m. In the James Cameron film Avatar, the protagonist who saves a planet from the evils of a greedy off-world mining company is a paraplegic warrior, a former Marine who leads the native population to a rebellious victory and succeeds in ousting the mining company from their paradisiacal world. The beloved and once former mayor of Crested Butte, W Mitchell, was the real life Avatar hero for Crested Butte in the 1970s when the AMAX mining company sought to extract the mother lode of molybdenum from Mt. Emmons, aka Red Lady mountain, the western sentinel of town. 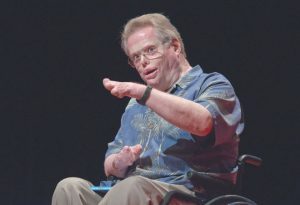 Mitchell began his life outside of Philadelphia and joined the Marines when he was 17, attending the University of Hawaii at night while he served. When he was discharged from the service, he stayed in Hawaii, working as a bartender and a deejay. Both, he says, came in quite handy later when he moved to Crested Butte. For a while, he moved back to his hometown of Philly, working as a substitute teacher. “The only skill I possessed for that job was that I was alive. I loved it,” he laughs. Mitchell became involved in Robert F. Kennedy’s presidential campaign, going to rallies, and even spending a little time with the New York senator before Bobby’s assassination. In June of 1968, having been to San Francisco briefly during the previous year’s “Summer of Love,” he found himself in Height Ashbury alongside the famed Diggers. “I was eating their free lunch. They had a truck that went around and that also parked at the entrance of Golden Gate Park and they served anyone a free lunch,” he recalls. “The lunch was whatever they had and were serving that day. The Diggers believed everything should be free. They had a famous store where you could go get a free pair of jeans or anything that anyone had left.” Although Mitchell never considered himself a hippie, he was pretty progressive. His first job was as a taxi driver, with a little bartending in between. But he remembers, “The coolest job I had was driving a cable car. It was the coolest job in the whole world. It was fun, and it’s the only, and the last street cable car company in the world. You had to physically work hard to operate the cable. The cable runs under the ground, continuously running, like a ski rope tow, and there’s a device in the car that has a grip that extends down from the car with a two-inch slot. The grip is operated by a gripman, and I became a gripman. There were only 60 people on the planet with that job,” he says. “You pulled back on the lever and each time you pulled it back, you squeezed the cable. You’re pulling a car with 125 passengers on it, a tremendous amount of weight. You get skinny, but you get biceps,” he says of the perks of that hard labor, and says he lost so much weight in the first month that his uniform had to be refitted and altered. He also loved that the job was more or less outdoors, and he grins about the coolness factor. “There were lots of pretty girls who love guys who are in charge, and guys who are in uniform, whether it’s Sgt. Pepper or guys in cable uniforms,” he says. Mitchell’s girlfriend at the time joined him from San Francisco and they bought ski passes for that winter season. Returning to San Francisco in the spring of 1971 to his gripman job on the cable cars, Mitchell started taking flying lessons. “That June I had gotten far enough in my flight training that I soloed for the first time. That afternoon, on a brand new one-day old motorcycle, as I was approaching an intersection, a laundry truck ran a stop sign and we collided.” His bike went down, the gas cap popped open, and the heat of the engine ignited the gasoline, severely burning Mitchell. “A guy with a fire extinguisher ran out of a car dealership and put out the flames but I was burned over 65 percent of my body, including my face and hands.” He spent four months in the hospital, and had most of his fingers amputated. His helmet saved his life and kept his head from being burned. He was only 27. “I was young and healthy and had good care. I went home but I had to be taken care of a lot. Because of the extensive burns on my hands, I couldn’t touch anything.” He recalls the pain and inability to do simple things like reach into his pocket. He had to be dressed and bathed and fed. “Think about a three-month old baby’s needs. I needed all of that. I couldn’t use my hands. Period. They were so sensitive. Over time, in about two years, I was able to drive and I started my flight training again,” says the undefeatable Mitchell. He found their friend Suzie and a few days later, Mitchell bought his house on Maroon Avenue, across from the fire station. “It was $35k, an old two-story coal miner’s house. I later found out that I was the greatest fool who ever arrived in Crested Butte, because anyone who spent that much on a Crested Butte house was a fool,” he says. But this was the summer of ‘73 and Mitchell felt Crested Butte was just perfect and stunning. “Back then there were only about 500 residents, really small, and that was perfect. One of the things that I loved about town was, the first person I met asked what happened to me,” and he explained his burns and accident to them. “And in 15 minutes everyone in town knew, so I didn’t need to keep explaining what happened to everyone I met.” He feels that although some might call that gossip, “It’s usually because people care and Crested Butte was a town where everyone took care of each other,” he discovered. Tony Verzuh was a prime example of how people in this town took care of each other, despite their differences. Mitchell had tragically crashed his plane in Gunnison in November 1975, which paralyzed him, confining him to a wheelchair for life. After being coerced, practically guilted into filling a vacant Town Council seat for a few months until the election, Mitchell saw an article in the local paper about some exploratory drilling that was going on up on the face of Red Lady. “When you think of AMAX, you think of Leadville, Mt. Bartlett, the mountain that’s no longer there because they mined it. They took the mountain out of the mountain and the town is buried under all those tailings. We made Amax take us on a mine tour, Gillette, Leadville, about six towns where mining was a big industry.” Mitchell notes that in every one of those towns there were serious problems—domestic abuse, drug addition and alcoholism, and mental health issues. “The social impacts are greater than the environmental impacts in many instances. They were going to spend $2 billion to build the mine here. It would have been the biggest industrial project in the history of Colorado. In the construction phase, you have a gigantic turnover of people. You need all kind of workers, steel, concrete, bulldozers, ten times as many to build the mine as you need to run the mine. You have to find a place for all the construction-phase workers and schools for their kids, and then most of them are going to go away. And there’s no commitment to the community,” Mitchell says. Today, W Mitchell lives in California and is a respected environmentalist and conservationist who has repeatedly testified before Congress. His accomplishments have received media recognition on shows such as Good Morning America, The Today Show, NBC Nightly News and others around the world. He’s been a radio and television host, a successful author and an award-winning international keynote speaker. Most Crested Buttians who have known him feel that he is undoubtedly the Avatar who helped save his people and paradise from an evil and greedy mining company. It’s impossible to include all the many accomplishments and stories of W Mitchell in one news feature, so for more, go to wmitchell.com. Next HCCA turns 40, so celebrate this weekend!